Stairways in the home are often overlooked when it comes to lighting design. Climbing up and down staircases opens the door to trips and falls. This can be especially dangerous for elderly residents and small children. Fortunately, a few well-placed lighting fixtures can properly illuminate stairways and make them safer to traverse. Consider installing a few sconces, step lights, or if your ceiling height allows, one or two hanging fixtures to help prevent accidents. Also, keep in mind that having switches at both ends of a staircase is a convenient way to make sure no one ever has to ascend or descend in the dark. Stairways are often used to showcase family photographs and other decorations. Wall-mounted picture lights can draw attention to pictures and artwork. However, keep in mind that when it comes to stairs, safety should likely be your No. 1 concern. Learn about safety inspired lighting fixtures for your stairway at an Hortons Home store. Hallways are another area of the home that often get short shrift. Considering hallways are high-traffic areas, they deserve just as much lighting design consideration as all the other spaces. A top priority should be making sure your hallway is illuminated enough to prevent trips and falls. If there is furniture in your hallway, such as a small table with a vase on top, the right lighting fixtures will prevent you or a guest from bumping into it and making a mess or getting injured. A dimmer is the ideal way to provide sufficient light to safely maneuver down a hall at night. 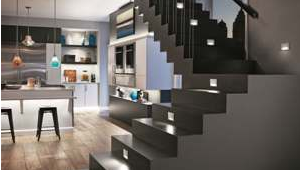 Like stairways, hallways are another ideal area in which to invest in accent lighting. Hallways are often adorned with family photos and artwork that can be easily shown off with some carefully planned track lighting, adjustable spot lights or wall-mounted picture lights. Visit an Hortons Home Lighting store to see attractive lighting options for hallways and out-of-the way spaces. What is the best way to convert recessed can lights in my hall and stairway to recessed spotlights, so I can highlight the artwork along the walls? Replacing your existing can lights is not difficult. An experienced electrician can do it with ease. First, determine what type of can is currently installed by removing the bulb, and gently pulling down the trim/reflector inserted in the can. When the trim/reflector is removed, a label with the brand name and model number should be visible inside. That information will enable you to find a proper replacement trim that is adjustable and will provide the desired accent lighting. Any lighting salesperson at an ALA-member store can show you the best options to easily retrofit your lights.